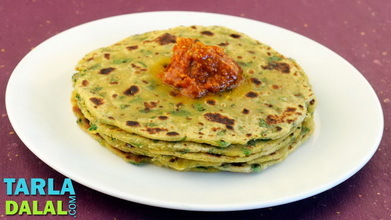 Padvali Roti is a traditional Gujarati snack, which is prepared frequently during the mango season to enjoy with aam ka ras. 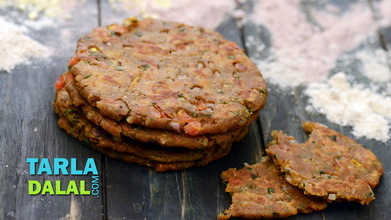 Although these thin Guajrati rotlis are prepared using just whole wheat flour, like any other roti, the method of rolling and cooking the Padvali Roti in pairs makes them quite different from other varieties like phulka. 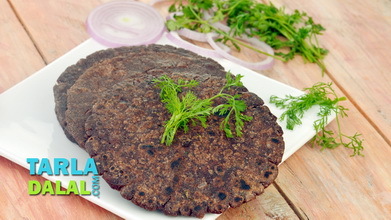 The thin Padvali Rotis are cooked only on a tava and not on an open flame. 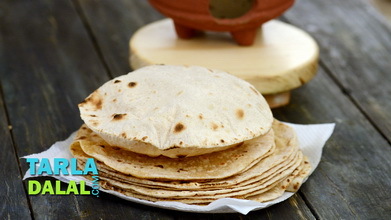 A pair of the rotis are layered for rolling and cooking, in order to make thin rotis that can be cooked perfectly without crisping them or burning them too much. 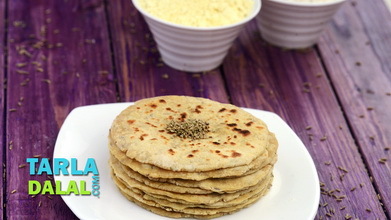 Follow the instructions as given to enjoy perfect Padvali Rotis, and make sure you serve some aam ras with them! Combine the whole wheat flour, oil and salt in a deep bowl, mix well and knead into a soft dough using enough water. Add 2 to 3 drops of oil and again knead it well. Roll 2 portions of the dough into 63 mm. (2. 5”) diameter circle using a little whole wheat flour for rolling. Brush one side of each of the 2 rolled portions with little oil and sprinkle some whole wheat flour evenly over it. Place one rolled portion over the other with the brushed side facing downwards and again roll into a 225 mm. (7”) diameter circle using a little whole wheat flour for rolling. 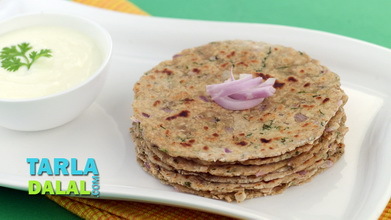 Heat a non-stick tava (griddle) and cook the roti on a medium flame till golden brown spots appear on both the sides. 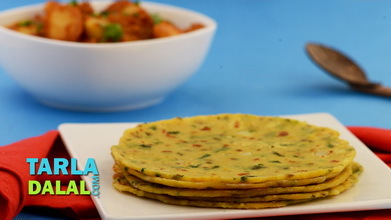 Remove on a plate, tap it lightly and gently separate both the layers. 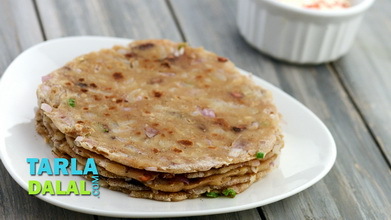 Repeat steps 4 to 8 to make 3 more padvali rotis. 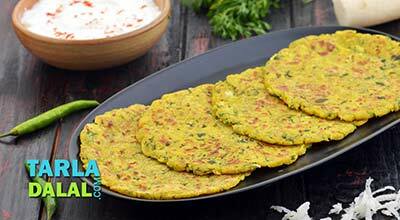 Apply ghee over it and serve immediately.